I’ve never understood the disdain so many gamers seem to have with pixel art. It’s used in countless indie games these days, which seems to be the main reason so many people have a problem with it — either because of the stigma surrounding indies in general, or because of its use to “cash in on nostalgia.” I don’t necessarily think it’s fair to judge it on either of these bases, though; like anything else, pixel art is a style that can be excellent or terrible depending on the skill and imagination of the artist wielding it. To my point, take a look at any of the screens for Chronicles of Teddy: Harmony of Exidus, or better yet, watch a video to see it in motion. This is one of the most gorgeous, painstakingly-detailed collections of pixel art I’ve ever seen, and it’s all part of one of the most delightful indie surprises in recent memory. This is a fully-realized project that defies gamers’ often unfairly low expectations of independent developers, creating a world well worth exploring. What’s great is that Chronicles of Teddy expects you to answer all the questions yourself. That initial swath of text is the longest you’ll see in the whole adventure, because there are no tutorials or long explanations of any kind to be found. Using the design philosophy often cited by Shigeru Miyamoto as a key part of the development of early games like Super Mario Bros. and the first Legend of Zelda game, developer LookAtMyGame expects you to learn by playing. That’s especially refreshing to see when so many of the elements here are from older games anyway — so new players will be able to learn the ropes intuitively, while fans of retro games will feel right at home with a tried-and-true set of mechanics. But while there’s plenty of old-school stuff here, there’s actually a good amount of freshness to experience as well. Beyond some fresh level and dungeon design, the best of the new offerings is the “Musicom” system. By collecting runes that represent both speech sounds and notes in the game’s fictional language, you can communicate with NPCs. Adding an extra layer, you fill your dictionary of words each time you talk to one of the little villagers, giving you more of a vocabulary to work with. While the vast majority of the game is a joy, there are a couple of things to be wary of. The game’s a bit tricky to get used to when you first start, for one thing, particularly with regards to the combat. 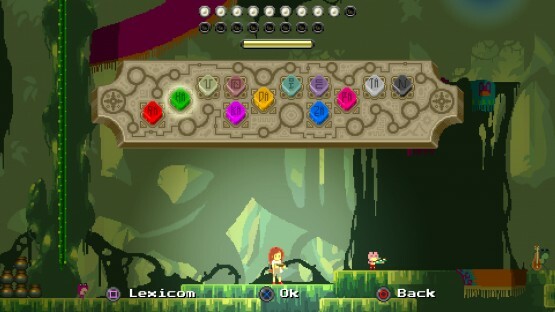 Until you have access to some of the upgrades you can purchase with “marbles,” Chronicles of Teddy’s currency, the protagonist’s movement and sword reach are pretty limited. This gives a pretty poor early impression of the mechanics, but thankfully they do open up and get better after a relatively short amount of time. Just keep an eye out for marbles (which are plentiful, to be fair), and prioritize upgrades to your combat abilities, and you’ll have a much better time getting into the game’s groove. As another small negative, the game’s “learn by playing” approach does backfire when it comes to some of the game’s less-intuitive puzzles — a problem compounded slightly by the fact that there’s no legend to explain how the map works. I could have done without having to figure out what exactly each icon or color on it represented. Still, this is another problem that’s relatively easy to overcome, and one that isn’t persistent once you’ve worked it out. I started this review with a little spiel about pixel art, because I think it’s one of those things that just turns a certain segment of gamers off before they see anything else. I think that’s criminal in the case of a game like Chronicles of Teddy, because this game does so much more with the art style than your average indie. This is a truly beautiful game, one in which every screen — from the smallest dungeon room to the largest overworld area — has its own identity forged from the intricate details around it. Stunning architecture in the library, trickling streams of water in the Ufara Palace and the screen-filling awe of the guardians in each world are just a few of the things you have to see to believe. It’s a testament to the strength of the animation that while the game looks great in screenshots, it’s another thing altogether once you see it in motion. The score goes perfectly with the details of the environments, too, providing a ton of soothing, ethereal tracks. Chronicles of Teddy: Harmony of Exidus might be labeled “just another indie game” by cynical gamers before they even get a chance to see what it has to offer, and that’s a huge shame. This is a huge, gorgeous adventure by any reasonable standards, and while retro gamers will probably get a kick out of it more than anyone, it’s not content to rest on its laurels and exploit nostalgia. For every way it recalls classic titles like Zelda II: The Adventure of Link, Teddy doles out a few original ideas of its own. Excellent level design, a number of fun-to-use items and the creative “Musicom” system, which lets you communicate with NPCs using music, prove that LookAtMyGame’s wonderful little indie goes beyond its inspiration. If you can put up with some irritation at the outset, including some frustratingly limited combat, you’ll watch this adventure blossom into something truly special. It’s one of the coolest indies so far this year. 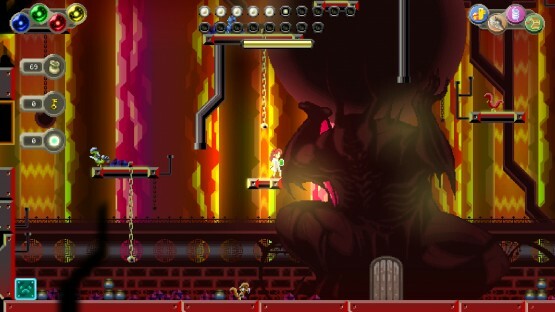 Chronicles of Teddy: Harmony of Exidus review code provided by publisher. Reviewed on PlayStation 4. For more information on scoring, please read our Review Policy here.